We want YOUR ideas for Series 4! Tally, Vic and Zanna pop by to share their news ahead of the new series of Fit and Fearless, which starts in May. 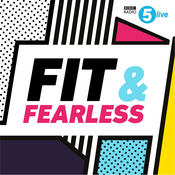 You can get in touch @bbc5live using #FitandFearless. Vic and Tally are joined by EastEnders actress Emma Barton (aka Honey Mitchell) who is running the London Marathon to raise money for the Dementia Revolution in aid of Barbara Windsor. Joining the panel is UK Athletics coach, ultra-marathon runner and sports dietitian Alex Cook, who is on hand to give you advice if you're training to run a marathon. Vic, Tally and Zanna are joined by endurance athlete and adventurer Sophie Radcliffe who in her own words "ripped up the rule book" by quitting her 9-5 job to take on extraordinary challenges. Vic, Tally and Zanna are joined by England women's rugby players Vicky Fleetwood and Leanne Riley to talk fitness, training and body confidence.